The Cabona family settled in the Jackass Ridge area of Truckee in the late 1800s. In 1918, they opened Cabona’s, which is now the oldest retail store in the region and is located in the historic downtown area of Truckee. Today, Stefanie Olivieri, a member of the Cabona family, runs the store. Sun filters through the forest on the Jackass Ridge property.Photo by Sara Taddo. 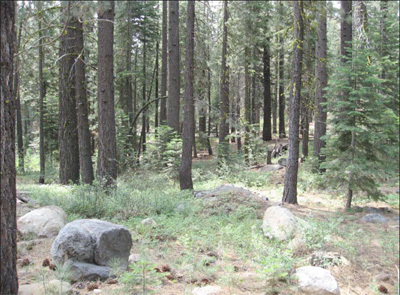 In the 1970s, Olivieri purchased the 80-acre Jackass Ridge property, which straddles Nevada and Placer Counties and consists of four parcels located in the shadow of Jackass Point. Over the years, Olivieri, watching the growth of the area, came to believe that conserving her land was particularly important for the community and visitors. The property is what people first see when they come upon Truckee on their drive into the Lake Tahoe area. For residents and visitors alike, the view is awe-inspiring. Olivieri’s decision to set up a conservation easement came about when she was talking with a friend about estate planning and mentioned that she wanted to keep her land undeveloped. 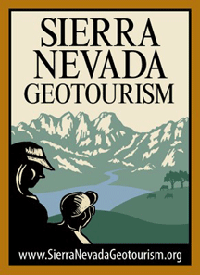 Her friend connected her with the Truckee Donner Land Trust (TDLT) and the process began. Olivieri started by putting 36.6 acres of forested land, located in Nevada County, in a conservation easement. Under the agreement, she is responsible for management of the forest: doing what is necessary to keep it healthy. Other than this, it remains untouched. With this first transaction complete, Olivieri is now in the process of working with TDLT to place 18 acres, located in Placer County, in a conservation easement. The remaining acres, where there is a house and barn, will remain outside the easement.